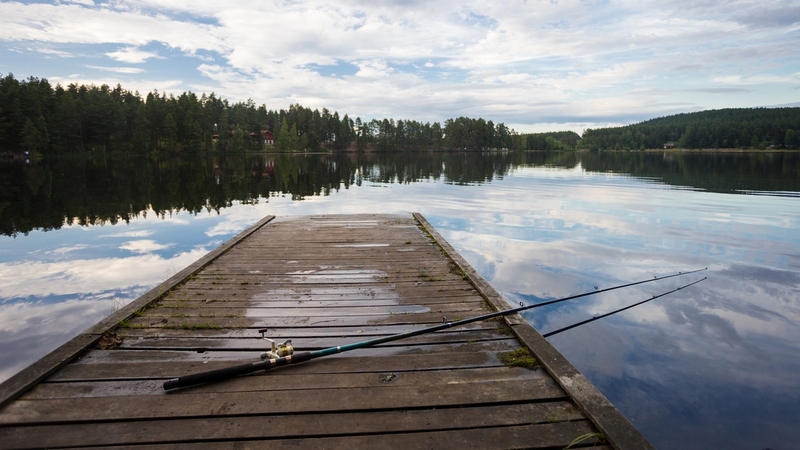 Among the perks of the Swedish summer there certainly is the possibility to go fishing, making the most of the many many lakes found in the country. Fishing is not really my thing, but both my dad and my boyfriend love it so in the past weeks this is something that we have been doing from time to time. I usually spend time collecting blueberries in the forest or just relaxing and reading by the lake. We haven’t been very lucky with fish, I must admit. Especially the last time we went – we caught and lost three, who set themselves free (well, good for them, I suppose), and the guy fishing 20 metres away from our spot kept catching more and more trouts. My parents went over to congratulate him and see the trouts he’d been catching, and in the end he gave us one of his catch. Now, the lake we’ve been visiting, which is called Stångtjärn, is a popular fishing spot as it is supplied every other week with a massive load of rainbow trouts. On our lucky days we had managed to take out of the lake regular-sized fish that weighed about 700 grams. The talented fisherman fishing next to us on our last adventure had managed to fish a few huge ones, and gave us one of those. I had never seen a trout so big. This beauty, whole, weighed 3 Kg and measured 62 cm. It was so big it could only fit my oven beheaded. I had seriously never seen such a catch, and even had no idea trouts could grow so large. In the end, we did come home with a fish, so the following day the menu was set. Now, among the spices that I own there is a little container I brought back from Camargue, southern France, two years ago: lavender salt. 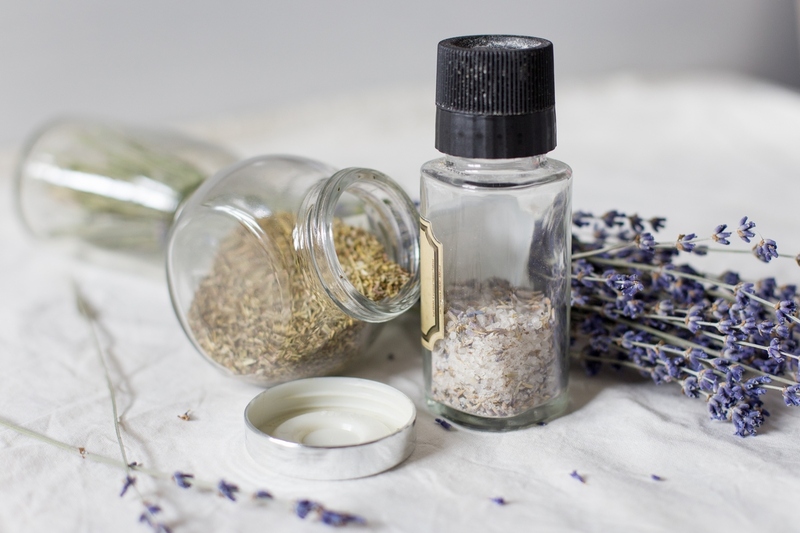 It is coarse salt mixed with dried lavender flowers, which comes in a bottle with a grinding cap. Since lavender is quite a strong scent I particularly like to use this spice with foods that have an even stronger smell. Namely, fish. Another thing I had brought back from Camargue was a good supply of herbes de Provence (pictured above in the open jar), which was the other key flavour I used to season my fish. 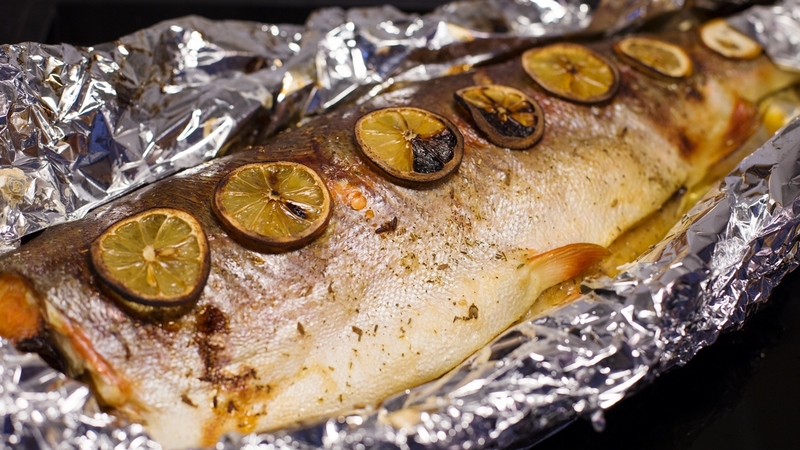 After seasoning the belly of the fish with lavender salt, herbes de Provence, lavender flowers, juniper berries, sage and bay leaves, we sprinkled some more salt on the outside, placed some lemon slices and wrapped it in foil. 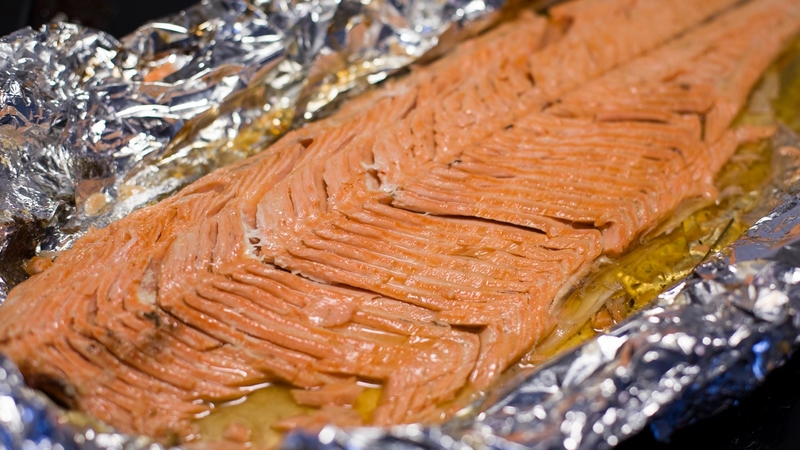 We baked it for over 2 hours at 200°C, first only with a small opening in the foil wrap to ensure it would absorbe all of the heat, then keeping the wrap completely open, to let it broil a little and make sure some of its juices would evaporate. Baking the fish whole, and seasoning only the belly and the skin, meant that the flavours did not get very much in its flesh. Whenever I use lavender salt on both sides of a fillet, the flavour is much more powerful. Seasoned like this, it was very delicate instead. 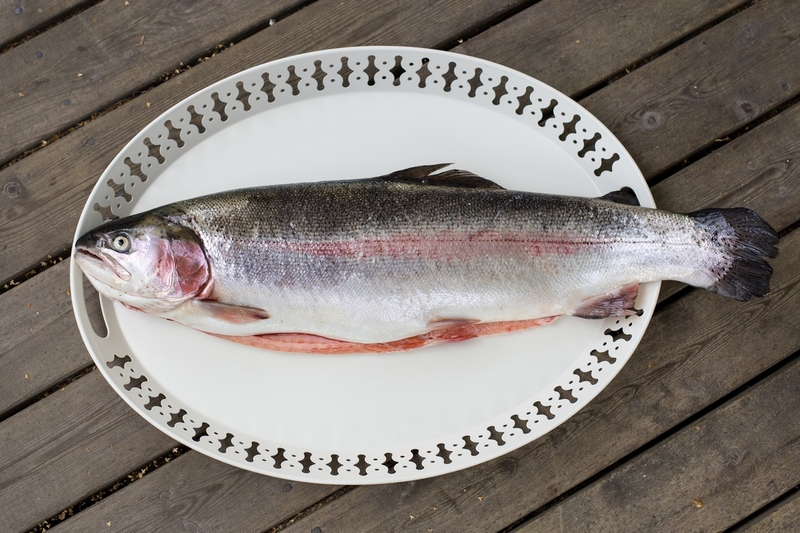 But we all loved it – authentic fresh rainbow trout straight from a Swedish lake. Furthermore, being this big, its fishbones were very easy to remove, and this made it even more enjoyable. What a great fish experience! I am so intrigued and impressed! There’s something decidedly cool about catching your own food, and the use of lavender salt – inspired! I’ve never used it before, but I have tons of lavender in my garden… I wonder if I can dry it and add salt? What do you think? GREAT post and fabulous pics! I think it would work, absolutely! That’s basically what it is: dried lavender flowers and salt. I think the nice thing about the one I brought back from France (apart from being fancy Provence lavender :P) is that it has a grinder. Freshly ground, the dried flowers release their full potential, so if I were you I’d keep it in a grinder for best results. Thanks for stopping by and let me know if you end up making your own lavender salt!! Thanks Eva, I will definitely try, and I happen to have a few empty grinders lying around. I’m excited to try it! This looks and sounds just beautiful!